Adoption is an incredible way to grow a family. It is also a very big decision for a family to make. There are numerous questions that go into the decision-making process, and many ingredients that go into a successful adoption experience. So, where do you, as a hopeful adoptive parent, begin? Starting the adoption process means asking questions: questions about your readiness to adopt, your hopes and dreams for the adoption, and about the path you will take towards adopting a child in MA. In this blog, Adoptions With Love will walk you through some of the questions you should be asking (and answering) before starting the adoption process. This is perhaps the most important question to ask yourself before moving forward in the adoption process. It is also something you will be asked during your adoption home study. Right now, you might be thinking that the answer is quite simple: you want to add to (or complete) your family. Before you start the adoption process, however, try digging a bit deeper. Do you want to adopt simply to fulfill your dreams of parenthood? Or is your real desire to love and care for a child, through good times and bad, and throughout their life? Are you considering adoption because you feel there is no other option left, or is your heart fully immersed in this loving act? If you have experienced infertility, it is important to grieve that loss before adopting a child. If you consider adoption “second best” to having a biological child, think about how that attitude might reflect on your child, and work through it. Finally, ask yourself if you feel pressured by anyone, such as your spouse or even society, to adopt. Choosing to adopt should be a decision made with love and compassion – your number one desire should be to love a child, regardless of their history and nurture them to adulthood. If this is true, congratulations! You are ready to start the adoption process. Are you prepared to adopt and raise a child – financially, physically, and emotionally? Before starting the adoption process, it is also vital to make sure you can fully provide for a child. Ask yourself if you can meet your child’s basic needs, such as proper nutrition and healthcare. Most of all, remember that parenting is more than a financial investment. While buying clothes and saving for college are very important, you must also be prepared to give your child unconditional love, support, and commitment. You must be able to provide a safe, stable, and loving home environment for your child as he or she grows and matures . Be honest as you ask this question. Do you have the funds, the time, and the aptitude to raise a child throughout his or her life? Remember, you do not have to be wealthy to adopt a child. You simply need to be emotionally, financially, and physically stable to meet his or her needs. There are many avenues you can take towards adoption. One major question you must ask before starting the process is whether you will pursue a domestic adoption or an international one. International adoption means adopting a child overseas, and will have different requirements, costs, and wait times than adopting domestically. If you choose to adopt internationally, you will need to work with a Hague Accredited intercountry adoption agency. While there are many orphans overseas, there are also thousands of children in the United States looking for stable, permanent homes. If you choose to adopt a child domestically, you can either work with a private adoption agency that is licensed in Massachusetts, or go through the foster care system. If domestic, do you want to adopt privately, or though foster care? If you decide that domestic adoption is right for your family, you must then consider whether you would like to adopt a child from foster care, or through a private adoption agency. About 25% of children in foster care are eligible for adoption – they have been removed from their homes or parents’ care, and need a permanent family. Many of these children are older, have siblings, or have additional needs. In contrast, most babies adopted through private, domestic adoption agencies are newborns. Adoptive parents who work with private adoption agencies often meet and are in touch with the expectant mother before the baby is born. Some meet their baby for the first time right in the delivery room. To make this important decision, it is important to think about your family and which child will best fit in – Are you open to adopting a child that is older, or is it important for you to adopt a newborn? Are you open to adopting a child and his or her sibling(s)? Are you hoping to adopt a child of a certain race, background, or gender? Or are you open any child needing a safe, loving and permanent home? Do you want to have some relationship with your child’s birth parent(s) over the years? Open adoptions, in which a relationship between the birth mother and adoptive parents exist, is very beneficial for children. Do you desire an ongoing relationship with your adoption agency counselor? There are all important questions to ask in deciding if private or foster care adoption is right for you. Do you want to have a relationship with your child’s birth parents? Your answer to this question will indicate whether you would like an open, semi-open, or closed adoption plan. It is also a tough one for many prospective adoptive parents. Many hopeful parents who are just starting the adoption process feel apprehensive about open adoption and having a relationship with their child’s biological parents. In time, however, they find that this is most beneficial for their child. Open adoption allows adoptive parents and birth parents to get to know one another. It gives adoptive parents the ability to connect with their child’s birth mother as questions arise. It also gives the child an important connection to his or her biology, which is important in building an identity. Ask yourself if you would like to know about the birth parents’ family background and medical history? Would you like to speak with them during their pregnancy, or be at the hospital for the birth? Would you like to maintain a relationship with them after placement? This will also depend on the birth parents’ wishes, but it is important to think about before starting the adoption process. At Adoptions With Love, all adoptive parents agree to at least a semi-open adoption. This means that, if the birth mother requests, they are willing to speak with her or meet her in person before the adoption takes place. This typically brings peace of mind for everyone involved. Our waiting families are also all willing to send the birth parents letters and pictures over the years, to let them know how the child is doing. Of course, if you and the birth parents agree, you can choose to have a more or open plan. Adoption is a journey of love and patience, one that requires great thought, consideration, and a helping hand to guide you along the way. If you are a family in Massachusetts, we welcome you start this journey with us! Call us at 617-964-4357 to learn how to adopt a child in Massachusetts. 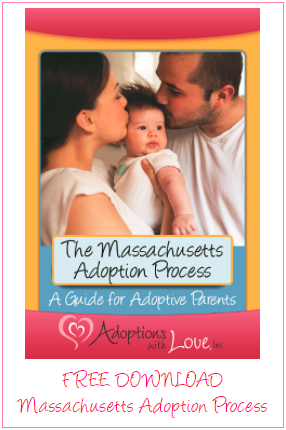 You may also download our free guide, “The Massachusetts Adoption Process,” below.